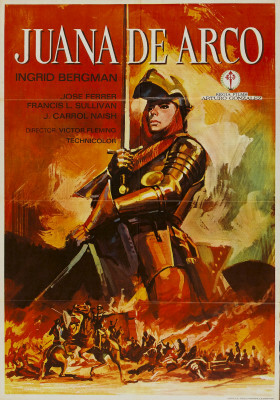 Long unavailable in its original 145-minute release version, the Ingrid Bergman-starring Joan of Arc (1948) as religious epic falls less in line with later ‘50s and ‘60s big screen epics than the more intimate religious dramas of that period, movies like The Song of Bernadette (1943) and The Miracle of Our Lady of Fatima (1952). Produced independently for release through RKO, it was unusual, a personal project for Bergman, director Victor Fleming, producer Walter Wanger, and writer Maxwell Anderson, whose Broadway play (also starring Bergman), Joan of Lorraine, it adapts. It was an expensive, Technicolor production, $4.65 million, yet seemed as doomed as its heroine. Fleming, following a failed romance with his star, died of a heart attack mere weeks after the movie's premiere, which received mixed reviews, and its box office, still considerable, was damaged by Bergman's scandalous affair with Italian filmmaker Roberto Rossellini, while Joan of Arc was still in theaters.